Recently, the framework of standards on auditing and guidance notes on related services are issued, wherein a difference between audit and related services is clarified. Related services include reviews, agreed upon procedures, compilation. The review is often contrasted with audit, but they are different in the sense that an audit is a thorough examination of the financial information of an organization, to give his/her opinion on the same. On the other hand, the review can be understood as the formal assessment of the financial statement, to introduce change, if any. This article presents you all the substantial differences between audit and review in a detailed manner. Meaning An audit refers to the systematic and intelligent examination of the books of accounts of an entity to check whether they present true and fair view or not. A review refers to an evaluation of the financial books, conducted by the auditor, to determine if there are any chances of modifications or not. The audit is defined as an unbiased and objective examination of the financial statements, records, physical inventory, operations, performances etc. of an organization, irrespective of its size, nature and legal structure, with the aim of expressing the opinion on the financial statements through an audit report. The auditor analyses whether the reports prepared by the entity conforms to the financial reporting framework, i.e. GAAP or IFRS. The two basic objectives of an auditor are primary objective and secondary objective, wherein the primary objective is to determine whether the financial statement represents true and fair view and the secondary objective is to detect if there are any errors or frauds, in the financial accounts of the client. 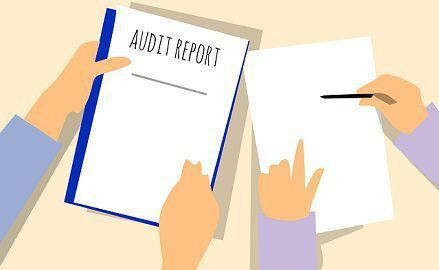 There can be two types of audits: Internal audit and external audit, wherein the internal audit is performed by the employees of the organization, whereas the external auditor undertakes the external audit. The review is defined as an evaluation of financial data, in which limited assurance is given by the auditor. In a review of the financial statement, the auditor is required to undertake the process that is important to give a proper base for obtaining moderate assurance, in essence, no relevant changes are necessary to be made in the financial statements of the company to conform to the financial reporting framework. In finer terms, it states that the financial statements are free from material misstatement, which is expressed as negative assurance. To conduct a review, the auditor is not required to have a complete knowledge of internal control system of the company and also know about the audit procedures. Further, review engagement relies on the analytical procedure and inquiries carried out by the auditor. A review can be understood as an official assessment of the account books, so as to identify whether changes are to be implemented if required. As against, an audit implies an independent critical examination of the books of accounts of the entity, so as to give the opinion/judgement on the basis of evidence or facts. An audit performed by an auditor provides high but not absolute assurance that the books of accounts to be audited is free from any pertinent misstatement. On the other hand, a review undertaken by an auditor, provides a moderate level of assurance, that the information so reviewed, is free from any material misstatement. In the audit, the opinion of the auditor is given as positive assurance assertion, in an audit report. Conversely, in a review, the auditor’s opinion is expressed as negative assurance assertion, in the report provided. When it comes to cost, the review is an expensive process as compared to the compilation, whereas, the audit is more expensive than a review. To sum up the discussion, it can be said that an audit is a more critical and systematic process as compared to a review. In an audit, the auditor should have full-fledged knowledge of the accounting process and the internal control system. Further, from a legal point of view, an audit of the business entities is mandatory, but review is discretionary.